Before inserting the EngineBlock AV into your system please make sure all pins on the system's expansion port are straight and aligned. Insert the EngineBlock AV very slowly and make sure everything is aligned properly. When inserting the EngineBlock AV if there is any resistance please stop insertion immediately and check to make sure there are no pins that are bent. Failure to do this could result in bent or broken pins. There is no way for the EngineBlock AV to bend or break expansion port pins unless the pins were already misaligned, bent, or broken beforehand. Neither Stone Age Gamer or the manufacturer is responsible for any damage of property this product may cause. USE AT YOUR OWN RISK. There may be audio noise that some users find distracting when using this product with a Framemeister via RGB. This is an issue with the Framemeister itself and not with this product. Stone Age Gamer charges a 15% re-stocking fee and no refund of any shipping costs due to returns regarding this issue. 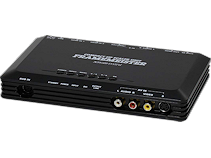 The Engine Block AV is a newer, more affordable, and better alternative to the original TurboBooster which adds new video outputs to the TurboGrafx-16 / PC Engine using a Sony CXA1645 video encoder IC. Internally the Engine Block AV uses the dbGrafx Booster TTP by dbElectronics. This product does NOT include any AV, S-Video or DIN9 cables. You will receive the adapter ONLY. Compatible with any TurboGrafx-16, PCEngine or SuperGrafx that has the rear connector for the Booster or CD add-on. Will NOT work with CD add-on or Booster attached. We recommended a cable with CSYNC, please contact us for a recommended source.